As we spread the good news of the Gospel, we envision this tent for our neighbors as both deep and broad, including all—irrespective of gender, ethnicity, sexuality, class, age, culture, country of origin, or ability. Contemplative spiritual direction is a way in for everyone to discuss issues of faith and sexuality, all grounded in God’s grace and love. To that end, we have developed a workbook for spiritual directors, seminarians, clergy, lay leaders, and community partners. 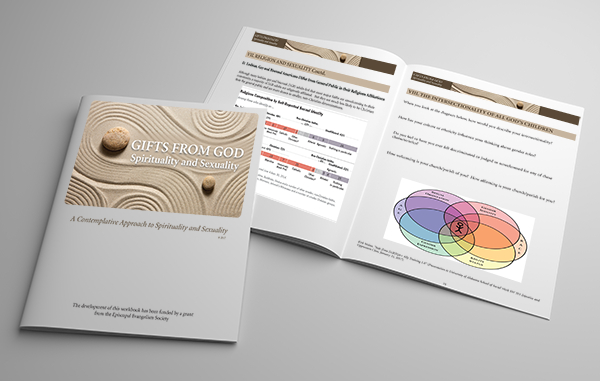 The development of the workbook has been funded by the Episcopal Evangelism Society (EES). Jesus declares, “Come unto me, all ye that labor and are heavy laden, and I will give you rest” (Matthew 11:28 KJV). Join us as we engage in healthy and honest discussions around spirituality and sexuality. We will not attempt to convince one another to adopt any view but rather offer a safe and sacred space to share knowledge, and to engage in open and honest dialogue. The workbook and resource guide will offer support to enter into your own interior life by providing guided meditation and prayer, journaling exercises, periods of silence and reflection, education, and resources. The workbook may be used individually, in small group discussions, or as a one day retreat. It is our hope that through pertinent prayer and an open heart, you will engage in this vulnerable journey to discussing sexuality and spiritually with those we love. May the mystery of your sexuality continue to be a gift from God.